The issue of democracy after democratization has been emerging in Korea and it is not only our issue, but also the worldwide issue of which many countries in the democratic transition period have been facing with. It was through civilian resistance from the April Revolution in 1960 to the June Democratization Movement in 1987 that we Koreans experienced direct democracy. But like most Asian countries, in Korea, direct democracy as an institutional form is a new topic for active discussion and a new sphere of challenge to seriously take on. This is because we are coming up with the agenda of direct democracy in Korea, where the concepts of all those direct-democratic instruments such as referendum and initiative are unfamiliar. Therefore, sharing the meaning and possibility of direct democracy, which is already practiced or pursued in many other countries, will be a valuable experience. The KDF have been cooperating with the global network on direct and participatory democracy since 2008. As a alternative and practical idea, we have been trying to bring the global agenda on direct and participatory democracy into korean society and at the same time, introduce korean cases on participatory democracy to the global society. 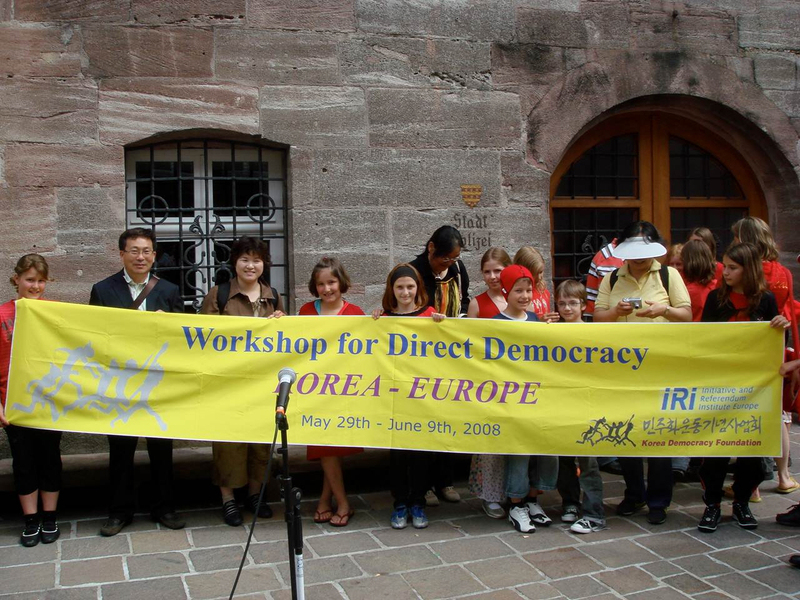 We had participated as a cooperating organization in the first Global Forum on Modern Direct Democracy held in Aarau, Switzerland in 2008, third forum held in San Francisco, USA in 2010, forth forum held in Montevideo, Uruguay in 2012 and hosted the second forum in Seoul, 2009. In addition, we had published some materials on this topic. We had published Korean version of direct democracy guidebook to introduce Switzerland case which has most progressive form of direct democracy and also made the first book which put various Korean participatory democracy cases together. Moreover, we compiled each cases from diverse countries which had presented at the 2009GFMDD in Seoul into a book titled [Global Citizens in Charge]. Besides, we had held small events in Korea to discuss our current situation regarding of direct and participatory, and sometimes we invited global figures like Bruno Kaufmann, who is a president of Initiative and Referendum of Europe & GFMDD and also takes a position as a deputy mayor of Falun city in Sweden, to share global experts' experiences. The KDF will keep trying our best to find and share new idea & agenda including direct and participatory democracy to develop democratic culture and sustainable democracy beyond representative democracy.